Over the past few years, more than a few novels have taken inspiration from Jane Austen's work. There have been various modern and futuristic re-tellings of Pride and Prejudice so I was more than a little curious to read the dystopian story inspired by Jane Austen's Persuasion, a novel which I have come to love just as much, if not more, than Pride and Prejudice itself. 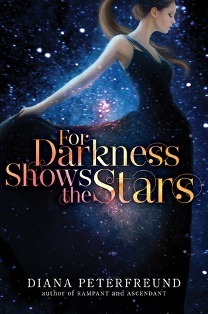 However, to my greatest surprise and immense disappointment, the fact that For Darkness Shows the Stars is inspired by Persuasion, and takes much of its plot-line from it, was one of its greatest downfalls as a novel. One of the many aspects in this novel that happened to grate on me was the fact that the slavery in this story was completely glossed over. Elliot claims that none of the brutality, harsh punishments, and danger that the Reduced and the Posts faced as slaves ever happened on her plantation, and as such, this issue was discarded and never brought up again. Although Elliot does her best to protect the slaves on her plantation and does her best to make amends to their lives, she still does nothing to release them from their bonds to her as an owner. As an American who has had the history of slavery and the Civil War pounded into her head year after year, I can say that even if torture was not occurring at Elliot’s plantation, injustice certainly was. I kept expecting Elliot, who herself has fallen in love with a Post, to do something by the end of the novel to aid these slaves and end the reign of slavery on her fields by giving them wages, but I was disappointed by the lack of action on this front. Slavery has been studied time and time again merely because of its utter significance and the fact that this topic was never given the amount of depth or consideration that it deserved to get in this novel bothered me.